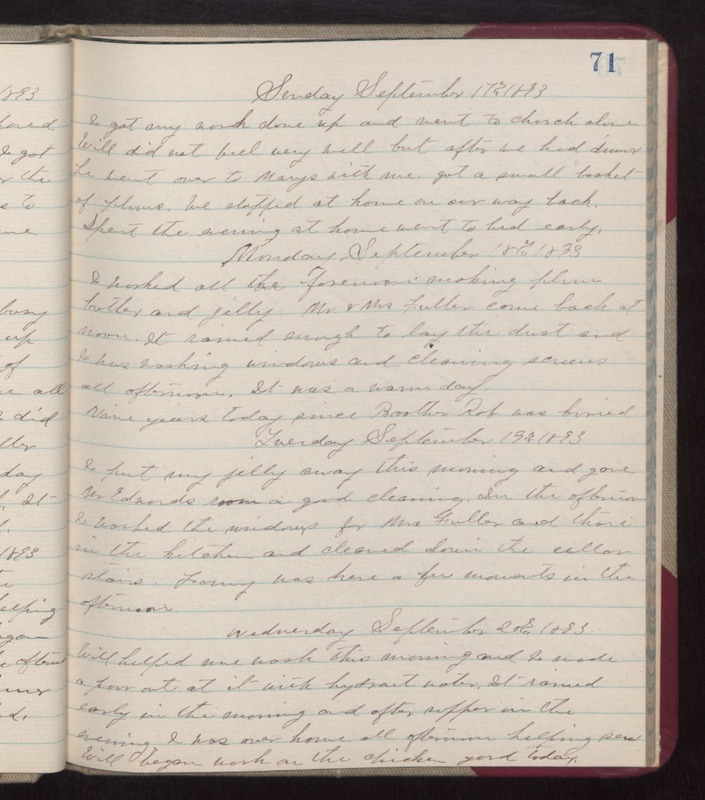 Sunday September 17th 1893 I got my work done up and went to church alone. Will did not feel very well but after we had dinner he went over to Marys with me. Got a small basket of plums. We stopped at home on our way back. Spent the evening at home. Went to bed early. Monday September 18th 1893 I worked all the forenoon making plum butter and jelly. Mr & Mrs Fuller came back at noon. It rained enough to lay the dust and I was washing windows and cleaning screens all afternoon. It was a warm day. Nine years today since Brother Rob was buried. Tuesday September 19th 1893 I put my jelly away this morning and gave Mr Edwards room a good cleaning. In the afternoon I washed the windows for Mrs Fuller and those in the kitchen and cleaned down the cellar stairs. Fanny was here a few moments in the afternoon. Wednesday September 20th 1893 Will helped me wash this morning and I made a pour out of it with hydrant water. It rained early in the morning and after supper in the evening. I was over home all afternoon helping sew Will began work on the chicken yard today.